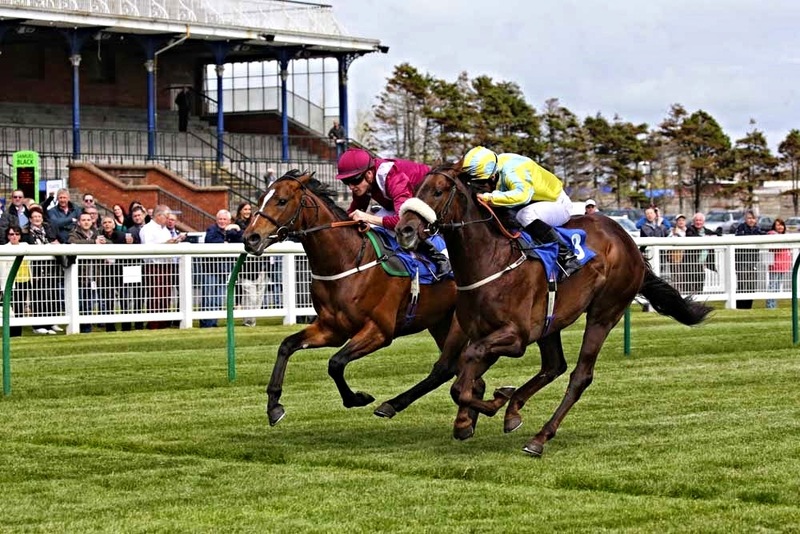 THE first dead heat at Ayr Racecourse in many years marked the opening of the two-day May meeting last Wednesday. In a pulsating finish to the six furlong maiden Ancient Astronaut, ridden by Phillip Makin and trained by John Quinn, got up on the line to share the spoils with the Kevin Ryan trained Shane Gray ridden Ferryover. Quinn and Makin won the corresponding race last year with The Wow Signal who went on to win the Coventry Stakes at Royal Ascot and the Group 1 Prix Morny at Deauville. Ancient Astronaut will attempt to emulate his now retired stablemate. The in-form Linda Perratt saddled a winner on each of the two days with the same horse. On Wednesday Rock Canyon was successful over six furlongs in the Weddings At Western House Hotel Handicap. On Thursday over the shorter distance of five furlong Rock Canyon came with a late thrust to pip another Perratt runner Saxonette and land the Bacardi Carta Oro Handicap. PJ McDonald was in the plate for Wednesday’s win but had chosen to ride Saxonette on Thursday with Connor Beasley benefitting. Ayr’s top flat trainer Jim Goldie was successful on the opening day with Classy Anne winning the New Website at ayr-racechourse.co.uk Handicap with Fergal Lynch riding. Thursday’s feature race, the Tennent’s Lager Handicap over a mile was won by the David O’Meara trained Fort Bastion ridden by Sam James, a three and three quarter length winner from outsider Pintura, trained by Alistair Whillans. Hawick based Whillans had earlier won the Famous Grouse Handicap with Vicky Valentine ridden by PJ McDonald. Mark Johnston won the opening Guinness Golden Ale British Stallion Studs Maiden Stakes on Thursday with odds-on favourite Rogues Gallery ridden by Paul Mulrennan; and the final race of the two-day meeting, the Caledonia Best Handicap, saw Royal Duchess trained by Lucy Normile and the mount of Samantha Bell get up close home to foil Hellbender.